The Shining (1980) Horror : A family heads to an isolated hotel for the winter where an evil and spiritual presence influences the father into violence, while his psychic son sees horrific forebodings from the past and of the future. We love horror and cult films, so of course we are thrilled that Saturday, May 23rd, 2015 is the 35th anniversary of the cinematic masterpiece The Shining by the late Stanley Kubrick. Wow, where did the time go?! Not like it matters, because the film has aged beautifully, like a forbidden wine; it’s grown more complex and intriguing as well as more disturbing in the visions it causes once consumed. So enjoy this The Shining themed post with little-known facts, tips for an intimate film screening night, and a recipe for a drink even grumpy Jack Torrance would enjoy! Stanley Kubrick, known for his compulsiveness and numerous retakes, got the difficult shot of blood pouring from the elevators in only three takes. This would be remarkable if it weren’t for the fact that the shot took nine days to set up; every time the doors opened and the blood poured out, Kubrick would say, “It doesn’t look like blood.” In the end, the shot took approximately a year to get right. According to Shelley Duvall the infamous “Heeere’s Johnny!” scene took 3 days to film and the use of 60 doors. The scene towards the end of the film, where Wendy is running up the stairway carrying a knife, was shot 35 times; this is the equivalent of running up the Empire State Building. The snowy maze near the conclusion of the movie actually consisted of 900 tons of salt and crushed Styrofoam. The image of the two girls in the hotel corridor was inspired by the photograph “Identical Twins, Roselle, New Jersey, 1967” by Diane Arbus. We highly encourage parties for any occasion, and this certainly merits one! 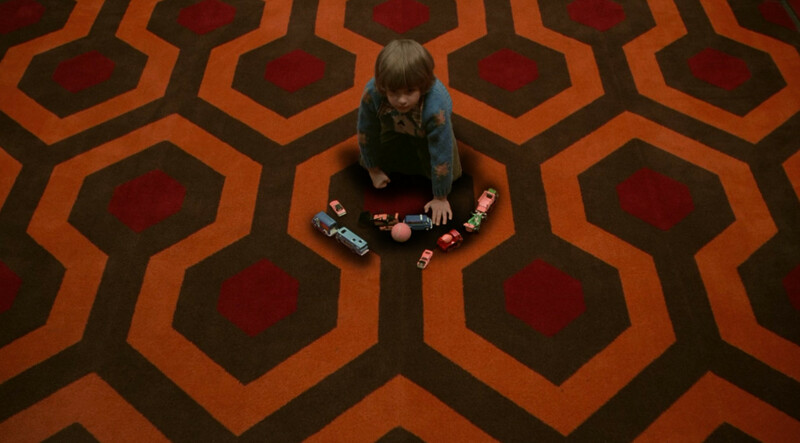 We suggest a small intimate screening of the cult classic with your closest friends or loved one, and snuggle together under the ultrasoft The Shining Throw Blanket. 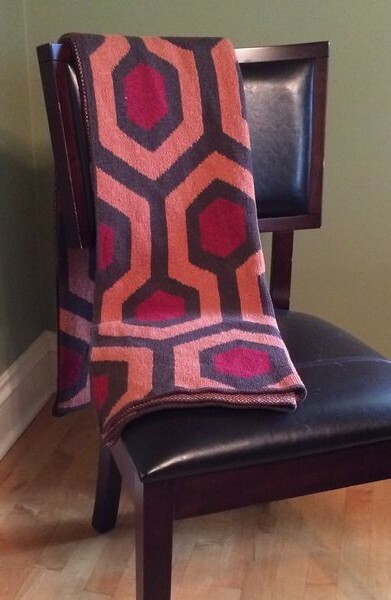 This blanket was inspired by the Overlook Hotel decor. Little Danny rides his tricycle through halls with carpeting featuring a bold geometric pattern that has become iconic over the years! The retro colors and repetitive print are eerie yet at the same time nostalgic. We teamed up with a local knitter who works with recycled cotton to make these beauties. They are made in the USA from recycled cotton that is created from pre-consumer fibers and clippings that are collected after the cut and sew process. This is great because it means that new pieces that would otherwise be discarded get a second life. It’s an awesome, environmentally friendly method of manufacturing. Also, these functional works of art are machine washable and 50″ x 60″, which is plenty big enough for throwing over your head to cover your eyes during the scary parts! Of course all gatherings call for refreshments, no matter how small, and in this case you’ll definitely need something to moisten your dried mouth which been parched by fear. We found a great recipe for REDЯUM Cocktail! It’s delicious and has the benefit of being bloody red, because nothing says The Shining like blood! Simply muddle 6 cherries in a rocks glass and tightly pack in crushed ice. Add a shot of clear rum followed by 1/3 cup of citrus soda, squeeze a lime wedge and stir. Add a splash of grenadine and drink it down! One cup of soda in lieu of rum, or fruit punch also make great nonalcoholic substitutes! Simply grab a blanket and be warm & cozy forever. . . and ever. . . and ever. . .